I was having a multiple overtake and be overtaken by a wonderful Zephyr in a lovely shade of salmon. He wasn’t hanging around at some points, think he went off at Mansfield. Then there was a MGB rubber bumper on a W plate, he was fully loaded in the back with all sorts. A Zephyr eh? 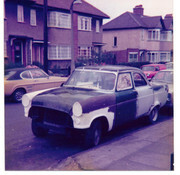 That reminds me of my dad's brief flirtation with a Zodiac (MK4), which in 1970's Bradford was less than ideal according to my Dad because most of the car was out in the road before he could even get the chance to look left or right! Boy, I bet you'll be sorry you mentioned Zephyrs. She's my '55 Mk1, Australian assembled, example. Okay, so that has a fair amount of wow attached, so much so that it looks ridiculously perfect, that's a credit to you that is! I should mention that Purdey is for sale. Should anyone be interested, 12,000 UK Pounds will secure her. NO sorry, it doesn't include delivery. Although I wouldn't mind it if it did, because I'll be in the UK next August & September, and it'd be great to have her there for our touring. I named her after this Purdey. Thanks for the compliments gents, but I fear I've hijacked oily66's thread. Sorry. Tony, these things are not popular here. They were Fords opposition to the so called, local car, the FJ Holden. Despite the Consul/Zephyr/Zodiac being a superior car they were just a little more expensive and the Humpy Holden outsold them. They, Holden FX's & FJ's, have now reached cult status down here. As a result I would be lucky to get A$12,000 (7,000 pounds) for Purdey, but I know that if she was in the UK she's probably fetch double that. She's far from perfect though and needs her front struts rebuilding. This pricing anomaly is the same for my Dolomite SPRINT. Down here its worth around the equivalent of 5 to 7 thousand pounds. But I'd guess that it'd fetch a lot more than that in the UK. I am about to buy a Mk2 Zephyr ute. (Dependant on final price) Photo attached. 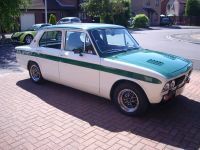 The owner is presently tidying it up..... repairing some minor rust, repainting it a correct light green and swapping out the wheels and tyres for standard spec ones. 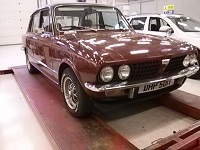 Its mechanically very good, having a Mk3 Zephyr engine and 4 speed gearbox fitted. I hope to use it to transport vintage farm engines to rallies..... yet another of my "expensive" interests. Rare as rocking Horse Manure....even down here where they built 16,000 of them. Again my apologies for hijacking the thread. I am now as green as that ute is going to be, though I can't help feeling that I like it just as it is, a real 70s throwback custom job! 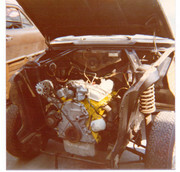 My only Consul, circa 1974, as you can see below, I started modding/customizing at a very early age! No hi-jacking going on here !!! Great to see other examples and hear tales from people that have owned them. We are all car people here! !